Toronto is home to Canada's Wonderland. Does Canada have any amusement parks? The answer is a resounding yes, and some of them are among the finest parks in North America. Does Canada Have Any Amusement Parks? You Bet! North America is a haven for amusement park enthusiasts and roller coaster fans, but not just in the United States. Canada is home to several outstanding parks that offer excitement and entertainment for all ages. Marineland is located at Niagara Falls and combines the thrills of exciting rides with the wonder of visiting with spectacular animals. The park is home to dolphins, killer whales, beluga whales, elk, deer, and numerous other species. Live animal shows, feeding opportunities, and petting areas make this a magical experience for all ages, and the park is planning major expansions that will include a tropical rainforest lagoon, stingrays, and an educational complex. In addition to animals, Marineland is also home to superb thrill rides. Sky Screamer is the world's highest triple shot tower, rocketing riders 450 feet in the air at speeds up to 60 miles per hour. The Dragon Mountain roller coaster is another world class ride, and it sprawls over 30 acres and through lengthy tunnels. Smaller rides are also available for all ages. Canada's Wonderland is part of the Cedar Fair Entertainment Company, the same company that owns and operates Cedar Point amusement park in Ohio as well as other parks throughout the United States. Canada's Wonderland in Toronto is home to more than 65 rides, including the most diverse collection of roller coasters in North America. Coasters include the dual inversion flying Time Warp coaster, the wooden twister Mighty Canadian Minebuster, and Behemoth, a massive 230-foot tall coaster that reaches speeds up to 77 miles per hour. Other rides include go karts, swings, a family log flume, carousel, the Psyclone spinning pendulum, and more. Canada's Wonderland is also home to Splash Works, a 20 acre water park. Tube, speed, and body slides are popular attractions, as well as the bowl slide, lazy river, wave pool, and splashtastic play area. Located in Montreal, La Ronde is a Six Flags theme park that is home to more than 40 amazing rides. Some of the most popular rides include the inverted Vampire roller coaster with its four inversions and the bold Goliath coaster that plunges from a height of 175 feet and reaches speeds up to 70 miles per hour. Other rides include a family train ride, elevated train with magnificent views, a flume ride, launch tower, and various spinning rides. Guests can also enjoy a range of shows, including music and comedy entertainment and special concerts throughout the summer. Playland is located in Vancouver and is a perfect park for families. The more exciting rides include a swinging pirate ship, the Hellevator shot tower, swings, and different circular spinning rides. Guests can also try the basketball court, shooting gallery, climbing wall, arcade, miniature golf, haunted house, and Glass House maze. Playland frequently hosts birthday parties, corporate events, family reunions, and other special occasions. Galaxyland is located in the West Edmonton Mall and is home to the triple looping Mindbender roller coaster. 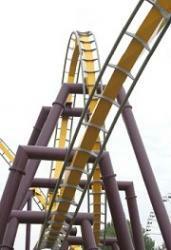 Other attractions include more than two dozen fun rides such as a kiddie Dragon Wagon coaster, 3D movie, swinging ship, carousel, and the Galaxy Orbiter, a unique spinning coaster. Visitors can also enjoy laser tag, rock climbing, and a space-themed children's play area. Located in Calgary, Calaway Park is home to more than 30 fun family rides. The Vortex double corkscrew coaster is the most extreme ride, and many attractions are great for younger guests, such as the colorful ball crawl. The park also includes numerous picnic areas and musical entertainment for all ages. In addition to these major amusement parks, Canada is also home to some spectacular water parks. There is a Great Wolf Lodge in Niagara Falls, as well as the outstanding Fallsview Indoor Water Park that encompasses three acres of aquatastic fun. Toronto is home to Soak City, Kenosee Lake in Saskatchewan features Kenosee Superslides, and other indoor and outdoor water parks can be found throughout the country. Like all water parks, these and other attractions are home to various water slides, lazy rivers, wave pools, interactive play areas, and more. Always check park schedules. Northern parks may operate significantly shorter schedules due to unpredictable weather. Plan for appropriate culture. While many Canadians speak English, many areas may use a considerable amount of French as well. Furthermore, be sure to have the appropriate currency on hand. Follow all posted rules and guidelines. To have a safe park visit, always be a courteous guest and follow all safety regulations. The only quick answer to the question "does Canada have any amusement parks" is yes - after that, eager visitors have many unique and exciting amusement and water parks to explore.